Perhaps the biggest waste of resources in all of state government is the over-incarceration of nonviolent offenders and our mishandling of drug and alcohol offenders. It is costing us billions of dollars and it is not making a dent in crime. Listen to these numbers. In 1994, shortly after I came to the Court, the number of nonviolent offenders in Missouri prisons was 7,461. Today it’s 14,204. That’s almost double. In 1994, the number of new commitments for nonviolent offenses was 4,857. Last year, it was 7,220 — again, almost double. At a rate of $16,432 per offender, we currently are spending $233.4 million a year to incarcerate nonviolent offenders … not counting the investment in the 10 prisons it takes to hold these individuals at $100 million per prison. 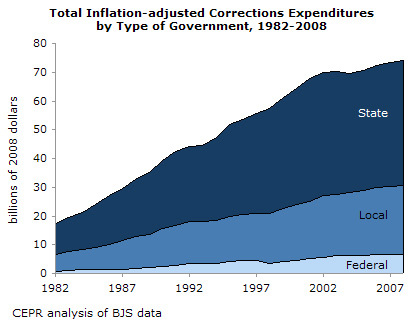 In 1994, appropriations to the Department of Corrections totaled $216,753,472. Today, it’s $670,079,452. The amount has tripled. And the recidivism rate for these individuals, who are returned to prison within just two years, is 41.6 percent. The problem is that this makes sense.